By now you&apos;ve heard about POODLE (CVE-2014-3566). If not, here&apos;s the "tl;dr": SSLv3 is vulnerable. Really vulnerable. There are remediation steps. And no, "disable SSLv3" isn&apos;t a good idea unless you know exactly how all the bits are bouncing around. Better course is to use TLS_FALLBACK_SCSV, the Transport Layer Security Signaling Cipher Suite Value. But that&apos;s beyond the scope here. First however, you need to know which servers are using SSLv3. ExtraHop does that. By default. No configuration required. how SSLv3 use compares with other cipher suites in use in your environment. Make sure you are running ExtraHop firmware 4.0 or newer. This bundle makes use of the dashboarding functionality that wasn&apos;t present in earlier firmware versions (i.e. 3.*). Navigate to Settings, then Bundles. 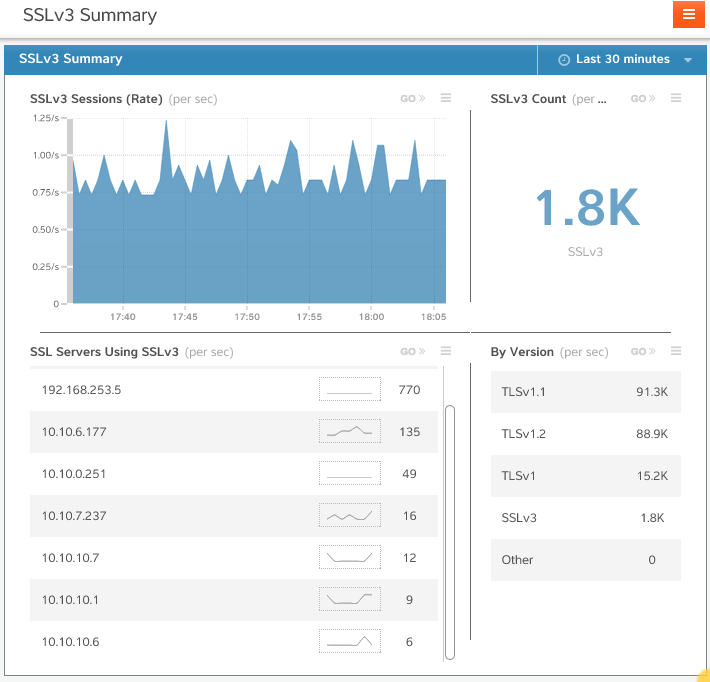 A new dashboard named "SSLv3 Summary" will be on your Summary Screen. It&apos;s the servers in that last group that may require attention.